Ever at the forefront of progress and innovation in Southeast Asia, Singapore is home to one of the region’s fastest-growing esports scenes. 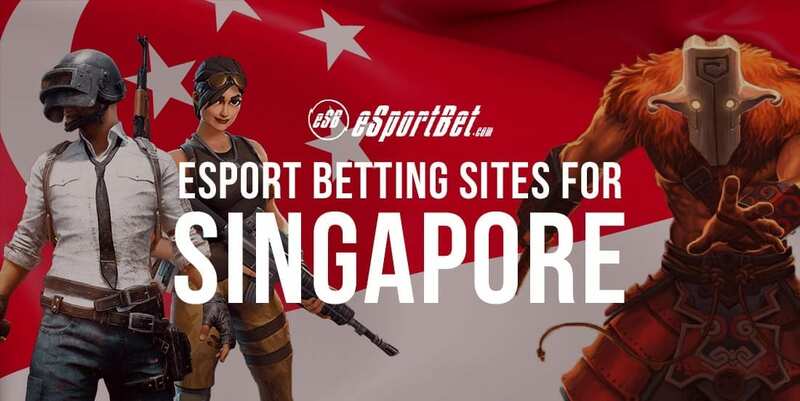 Find out how and where you can bet on Counter-Strike, Dota 2, League of Legends and all the biggest online gaming leagues with Singapore dollars. Before you can start placing wagers on your favourite esports games, you need to sign up with a trustworthy online betting operator. The bookmakers above are fully licensed and regulated, and we recommend opening accounts at all of them so you can compare the odds and ensure top value every time you bet. The next step is adding money to your account. Esports bookies support a wide range of instant deposit methods, including credit cards, debit cards and e-wallets. Most betting sites also offer welcome packages where new players can pocket hundreds of dollars in bonus cash upon making a transaction, so make sure to opt in if that interests you. Now it is time to put your money where your mouth is. Navigate your way to the esports section of the website, pick out the game, league, or tournament you wish to bet on, and scroll through the available betting markets. When you want to make a wager, tap the odds to add them to your virtual betting slip. Set your stake, confirm the bet, and you’re good to go. Singapore’s esports community is only young, but it is growing at a rapid rate. Expect many more top-flight leagues and tournaments to join those below in the coming years. Singapore eSports League – Established in 2018, the SEL is a national Dota 2 esports championship that runs year-round. The league uses a ladder format, much like a domestic football division, and aims to set the benchmark for professional gaming in Singapore. PVP eSports Championships – Singtel, one of the nation’s leading telecommunications companies, launched its own esports tournament in 2018, with some US $400,000 prize money on offer for place getters in Dota 2 and the popular mobile game, Arena of Valor. SEA Tour – Singapore is one of five countries that owns a slot on Southeast Asia’s premier League of Legends esports tour, where the winning team goes on to represent the region at high-profile events such as the Mid-Season Invitational and the LoL World Championship. Credit card – MasterCard, Visa and their related debit cards are accepted everywhere. Web wallet – Neteller and Skrill are staple deposit and withdrawal methods within the online gambling industry. Direct banking – Direct online banking sevirces such as Citadel Direct are available at most online bookmakers. Cryptocurrency – More and more esports betting sites are adding Bitcoin and Bitcoin Cash as accepted currencies. Wire transfer – Transactions take a few days to clear, but high rollers will happily wait to avoid transaction limits. Withdrawal options vary from bookie to bookie, so it pays to read up on the terms and conditions for your preferred banking method before you try to cash out your winnings. Like a lot of places in Southeast Asia, and particularly those with a historical Chinese influence, there is a strong gambling tradition in Singapore. Games of chance are often played in the home and are a common sight at social gatherings such as weddings and funerals. However, modern-day Singapore is renowned worldwide for its no-nonsense approach to vice and corruption. Just as chewing gum in public can land you behind bars, so too can gambling in the wrong place, with the wrong people, at the wrong time. In response to what was perceived as a national gambling epidemic, Singaporean government outlawed all forms of remote gaming and wagering in 2014. That legislation was relaxed two years later so the Singapore Turf Club and the Singapore Pools could launch online betting services for horse racing, motor racing, soccer, 4D and Toto, but they remain the only licensed operators in the country. At present, it is illegal in Singapore to bet with any offshore gambling operator. That raises a problem for gamers who like a flutter, because neither the Turf Club nor the Pools offer betting markets for esports. The simplest workaround is a virtual private network (VPN), which allows you to escape geo blocks and access just about any overseas betting site. Nothing is foolproof, however, and we stress that any and all online gambling activities are undertaken at the user’s own risk.